(Newser) – A nearly six-hour standoff with Baltimore County police Monday ended with a shootout that left a 23-year-old woman dead and a 5-year-old injured, the Baltimore Sun reports. 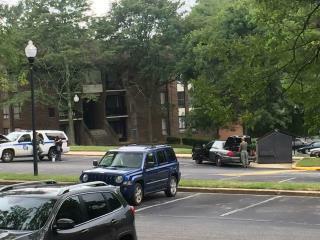 Cops arrived at a Randallstown, Md., apartment just before 9:30am to serve arrest warrants on a man living there and on Korryn Gaines, wanted for being a court no-show for a March traffic stop in which she was charged with disorderly conduct, resisting arrest, and traffic violations, Police Chief Jim Johnson says. The story, per Johnson: Even though cops could hear people on the other side of the door, no one answered when they knocked and IDed themselves, so they used a landlord's key to enter. Inside sat Gaines with the 5-year-old on her lap and a long gun pointed at them. What kind of evil byatch uses her child as a shield while holding a rifle? Cops shot a five year old.